What happened to the guy who sang Gangnam Style? In 2012, Psy shot to international fame after releasing "Gangnam Style." The single, released from his sixth studio album Psy 6 (Six Rules), sold millions of copies and made him a household fixture. But following the tremendous success of that song in the States, you may be thinking Psy—whose real name is Park Jae-sang—has all but disappeared. Think again. Let's find out what this earworm has been up to? Psy's cross-over international single, "Gangnam Style," earned him a myriad of accolades—perhaps none more prestigious than creating the first music video in history to earn one billion views, according to Guinness World Records. At the time of this writing, the contagious dance track had been viewed more than 2.6 billion times. 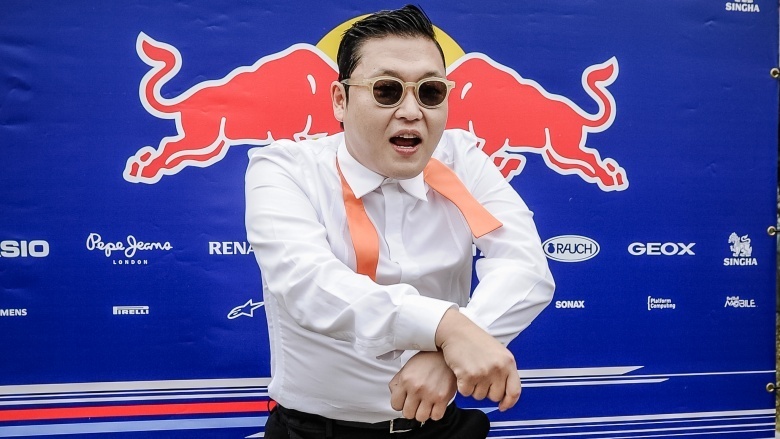 Psy picked up another huge hit with his follow-up single, "Gentleman." That song's video became the highest-viewed video in a 24-hour period, with 38 million views, and it continued to climb beyond the billion views mark. 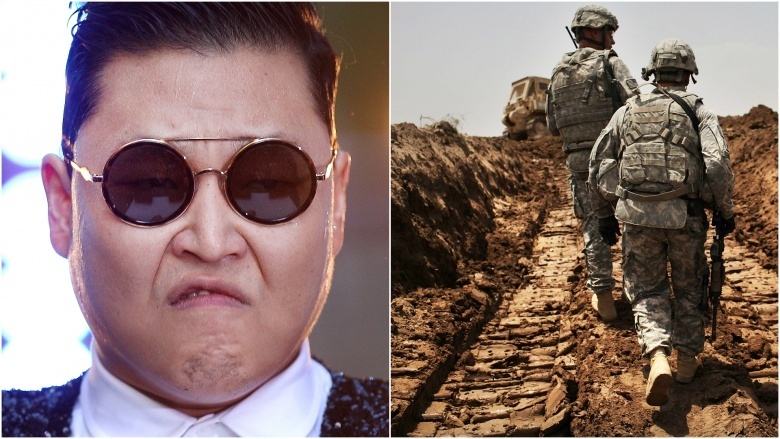 In 2012, shortly after Psy's rise to fame in the States, a 2004 video surfaced of the singer calling for the deaths of American soldiers, reported CNN. The controversial (and profane) lyrics are part of the protest song "Dear America," which was written by South Korean rock band N.EX.T. In the song, Psy raps the following lines (via New York magazine): "Kill those f**king Yankees who have been torturing Iraqi captives / Kill those f**king Yankees who ordered them to torture / Kill their daughters, mothers, daughters-in-law and fathers / Kill them all slowly and painfully." Not exactly the party anthem he's become known for. In a statement, Psy profusely apologized for his language, claiming it was an emotional response to the Iraq war and the death of two young Korean girls killed by a U.S. military vehicle. "I understand the sacrifices American servicemen and women have made to protect freedom and democracy in my country and around the world," read the statement, in part, via CNN. "While I'm grateful for the freedom to express one's self, I've learned there are limits to what language is appropriate and I'm deeply sorry for how these lyrics could be interpreted. I will forever be sorry for any pain I have caused by those words. While it's important that we express our opinions, I deeply regret the inflammatory and inappropriate language I used to do so." While Psy has enjoyed the spotlight and all the perks that come with fame, he's also battled a dark side. In 2013, he confessed to The Sunday Times that he was an alcoholic. His attitude about drinking proved to be shocking, in light of the constant positive press surrounding his name. "If I'm happy, I'm drinking, if I'm sad, I'm drinking," he said. "If it's raining, I'm drinking, if it's sunny, I'm drinking." He claims the only time he's not attached to booze is "when I'm hungover." His beverages of choice include whiskey, vodka, and tequila. The interview also exposed his constant smoking, something that's thought to ruin a star's voice. At the time of this writing, it was unclear if he ever sought professional help for his habits. In 2014, Psy and Snoop Dogg joined forces for a single titled "Hangover," which they debuted in the States on Jimmy Kimmel Live. The video was a gigantic hit online. It seems hundreds of millions of people enjoyed watching the unlikely duo—who met for the first time at the video shoot in South Korea—experiment with assorted remedies for too much of a good time. The gentlemen tried swimming in a fountain, brushing their teeth side by side, and partaking in the hair of the D-O-double-G.
Other fans voiced disdain at the mixology of K-pop and gangsta rap. "This is the biggest insult to the history of rap since the birth of Kanye West," read one comment on the video's YouTube post (via the Independent). Others complained the track featured too much Doggfather and not enough Asian persuasion. Regardless, Psy and Snoop have no doubt basked in their combined internet glory. "For me, it was awesome because I've always wanted to be in a martial arts movie, and I just felt like I was in the kingdom of it all," Snoop told Kimmel. "I felt like I was a karate star." Psy's K-Pop style certainly raised eyebrows around the globe, and it's probably safe to assume that North Korean leader Kim Jong-un doesn't appreciate his brand of music. 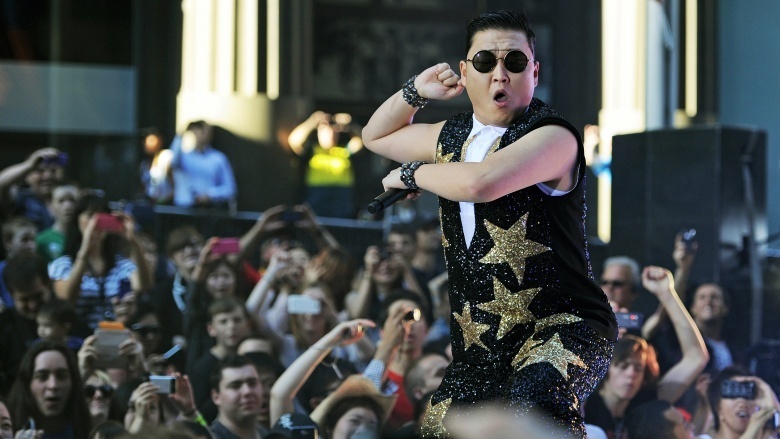 When asked how he felt about the dictator's threats to destroy both South Korea and America, Psy played it cool. "Well, as an entertainer I don't want to talk about politics," he told The Daily Beast. "As a Korean citizen, I want peace. That's all I can say. I want permanent peace. I want the North and South to be good, to be safe. In the near future we are expecting all these tragedies, and I just hope everything gets figured out very calm, and safe, and nice, and easily." After putting South Korea in the spotlight, the country tapped him to be its tourism ambassador in 2013, according to CNN. In lieu of a hefty payday, the pop star accepted minimum payment. Psy's appointment replaced Kenny G, who oddly enough was the face of South Korean tourism in 2012. At the time, Psy wasn't a stranger to important duties, as he had held the same honorary title for Seoul's Gangnam district in 2012. His appointment also opened doors for other business deals—most notably, his ambassadorship for Asiana Airlines for 2013. In December 2015, Psy released his long-awaited seventh studio album, Chiljip PSY-Da. Aware it would be nearly impossible to top his previous record, Psy reportedly felt immense pressure to succeed and fell into a dark depression. "I'm not an Adele," he told Entertainment Weekly. "After 'Gangnam Style,' I was really happy but sometimes I was not happy, because that's my lifetime biggest song and I'm not going to top that song forever. For a while, I kind of felt a little bit of pressure, like, 'How can I top that one?' I thought about being me, not the 'Gangnam' guy, or whatever. I was focused on finding myself." 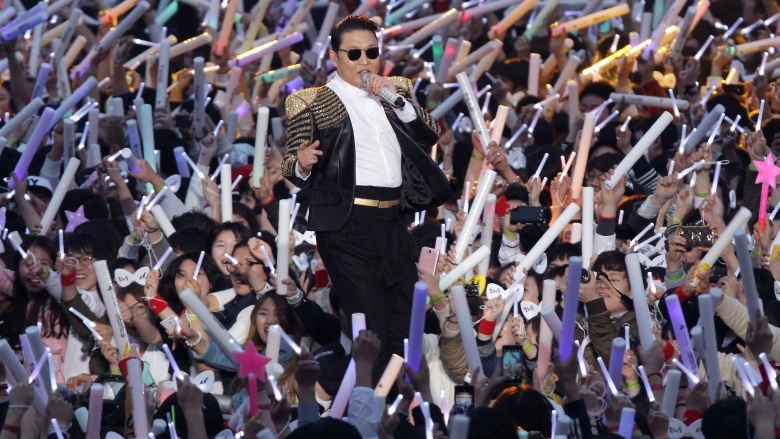 Though the album didn't top his past successes Stateside, Psy's new K-pop singles were very well received at the 2015 Mnet Asian Music Awards. Psy may not be the household name he once was in the States, but elsewhere in the world and online, his dance tracks and signature Capri pants are still tapping toes and turning heads. The video for his 2015 smash single, "Daddy," transposes the star's face on children's bodies, which is equal parts disturbing and delightful—and ingenious enough to attract hundreds of millions of YouTube views and a spot on the U.S. charts. According to Billboard, the accompanying album, Chiljip PSY-Da, was his first to debut on the top dance/electronic albums charts. The project also showcased more A-list collaborations, including an Ed Sheeran remix and a feature with will.i.am. If you're a Westerner who's suddenly wondering if you've been missing out, well, you have. But don't feel bad. It's true that Psy has not been spending as much time in the U.S. and European markets. Truth be told, there's more money to be made elsewhere. "Having earned an estimated [$55 million] from his work in the West, Psy is now racking up similar amounts from the lucrative Chinese market, where his collaboration with world-class pianist Lang Lang is currently producing a run of consecutive number ones," reported the BBC in 2015. "Psy's decision to focus on the Asian music market may be an indication of where the entertainment industry turns over the highest profits for musicians—China's entertainment market was last valued at [$95.7 billion.] How's that for a mic drop?